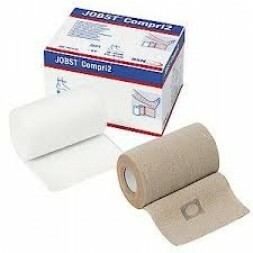 The new JOBST Compri 2 - 2 Layer Bandage System is especially designed for easy application. It provides graduated and reliable compression for up to seven days to help achieve effective oedema reduction. With 1st layer bandage that is tearable and stretchable in two dimensions it is easier to adjust and add padding to vulnerable pressure points. The 2nd layer with its simple visual compression indicator can be easily reapplied to ensure correct positioning.